Camp 4 Campground in Yosemite National Park is easy to access, offers inexpensive camping year-round and is the perfect spot for outdoor enthusiasts to enjoy rock climbing and hiking nearby. FIRST COME, FIRST SERVED. Camp 4 Campground Yosemite is listed on the National Register of Historic Places because of its association with the development of rock climbing within the Yosemite Valley. 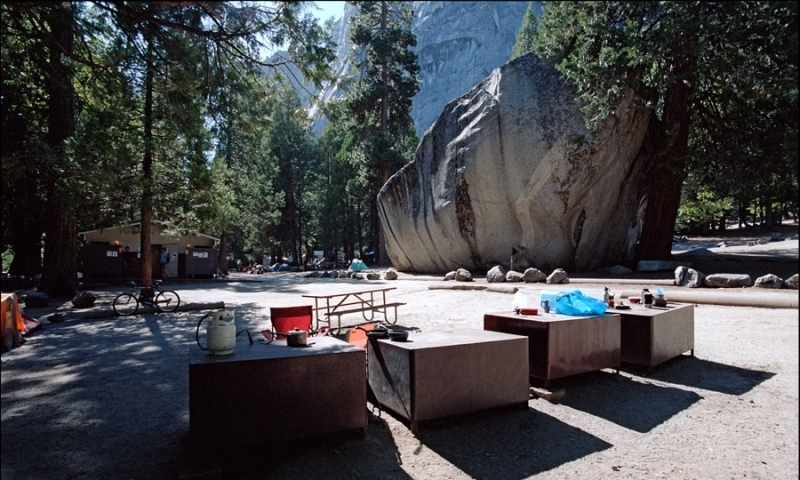 A popular campground to this day for climbers from all over the world, Camp 4 has food lockers, picnic tables, fire pits and more. Camp 4 Yosemite is on the north side of Yosemite Valley, southwest of the Yosemite Lodge. It’s located at the base of the Upper Falls hiking trail at shuttle stop 7. There’s a parking lot, but no roads within the campground, so you must carry in your gear. Yosemite Camp 4 doesn’t accept reservations but requires registration, which you can do with the ranger on-site. Each campsite is assigned 6 people so you may be camping with others you don’t know, but it makes for one big happy family. First come, first served. Yosemite Camp 4 Campground is best known for being a hangout for rock climbers. Climbers from all over the world come here to climb the boulders. You’ll meet people speaking French, German, Japanese and other languages. Climb the famous Columbia Boulder, its side painted with the white lightning bolt depicting this rock’s particular difficult climbing problem. Since this campground is at the base of the trailhead for Yosemite’s Upper Falls, there is almost no choice but to do some hiking while staying here. You can hike to the top of beautiful Yosemite Falls on a 7.2-mile roundtrip trek.